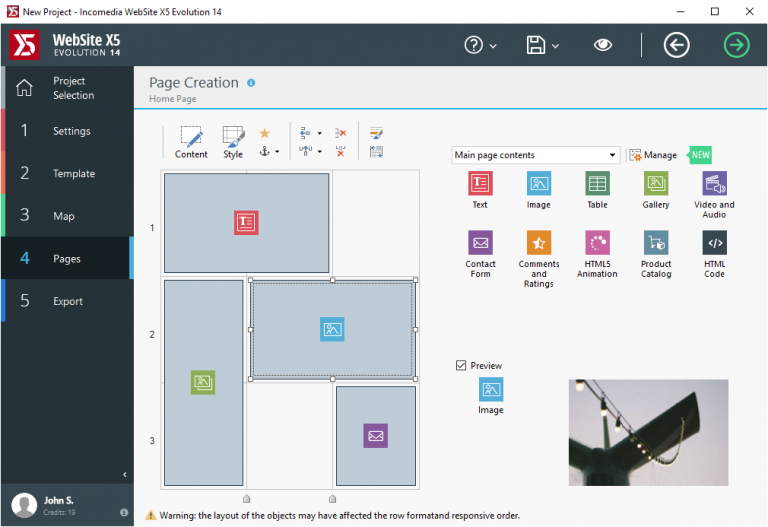 Incomedia has released a major new version of its wizard-driven web-building tool with the launch of WebSite X5 Evolution 14.0. Website X5 Evolution is accompanied by both higher (Professional) and lower (Start) packages. Version 14.0 focuses its new features in three key areas: usability, graphics and performance. Highlights include more flexible navigational menus, better support for web fonts, additional special effects and revamped blogging and ecommerce modules. Website X5 14.0 opens with usability improvements. It’s five-step start wizard has been tweaked to allow users to pick a template before beginning a new project, while the default template no longer has to be changed. Elsewhere the template editor now offers multiple-choice, a magnetized grid-based layout and commands for placing and lining up Objects, which are used to create headers and footers. The Backup Manager is now more proactive when prompting users to create backup copies, and it also allows users to schedule automatic deletion of old backups. Graphics changes include converting the navigation menu into an Object, allowing it to be added to both templates and individual site pages as required. The menu can now be placed where desired and the Sticky Bar design can now also be customized. The default set of templates has been overhauled, with 200 older examples replaced by newer, more modern designs. Web fonts are now directly linked to projects making them easy to swap out and download without having to leave the program. Users can also quickly change default font to update a site’s design with one click. New graphics options have been added to the email form, while full-width rows and parallax effects along with a tweaked Showbox window make it easier to create eye-catching slideshows and other visual elements. The new version is rounded off with added features and improvements to Website X5’s E-commerce and Blog components. WebSite X5 Evolution 14.0 is a function-limited demo download for PCs running Windows 7 or later. 2GB RAM and 1024×600 display required. Pricing starts from $19.99 for the cut-down Start edition; WebSite X5 Evolution 14.0 can be purchased for $75, while Pro licenses cost $199 -- each license covers two PCs and unlimited websites. Time-limited discounts for existing users of up to 50% are also available.